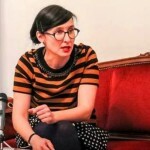 Ankica Čakardić is an assistant professor at the Department of Philosophy, University of Zagreb. She coordinates educational programmes at the Centre for Women’s Studies in Zagreb, is a member of The Organisation for Workers Initiative and Democratisation, Croatia, Women’s Front for Labour and Social Rights and the Feminist-Marxist reading group FemFront. What does the 8th of March mean in Croatia? How is it celebrated today, and how do you think its meaning/celebration has changed in recent years, and especially in comparison to the YU-days? Since the war in post-Yugoslav Croatia the socialist and antifascist feminist tradition, including the celebration or even the mention of International Women’s Day, has suffered considerable neglect and at times even a deliberate discursive exclusion. That procedure was a part of the “manufacturing of consent,” which was a necessary step in the establishment of the new regime (the “transition” from socialism to capitalism). In recent years the 8th of March is celebrated mainly in a liberal-conservative manner – as a kind of “Mother’s Day” or something similarly notorious – completely emptied of the progressive meaning connected with its labour and social-historical role. Can you comment on the current social situation of women in Croatia? In particular are you able to judge whether there has been progress or decline in the post-socialist years compared to before? Unfortunately we can really only speak of a decline in the situation of women. During the 1990s the ground was prepared for the further accumulation of capital and privatisation of common/public goods. From a leftist-feminist context, and very schematically speaking, the attack on the public sector has brought, among other things, a removal of the material rights gained by women’s entrance to the labour market. And during this process we witnessed a crisis of social and class reproduction, the financial burdening of households and the strengthening of the patriarchal-capitalist mode of production. As an example, while socialism advocated that “women’s” issues, primarily reproductive work such as housework or care work, were to become socialised in practice, capitalism and the neo-liberalisation of society represents an active regressive role of the state in organising the commodification of social services. Can you give of example of an inspiring woman from your context? Instead of mentioning one woman, I would rather give credit to an organisation. The Women’s Antifascist Front (AFŽ) was the single most important organisation of women during World War II and in the period of Yugoslav socialist self-management. Although AFŽ was programmatically linked to the ruling League of Communists, from the beginning it worked independently, and had an autonomous network of organisations and management. By the end of 1942 the Croatian AFŽ had already gathered around 250,000 women, and was publishing its own journal Žena u borbi [Woman in Combat]. AFŽ was dissolved in 1953 but the institutional struggle against patriarchy continued to work through several other groups including, for example, the Croatian Conference for Women’s Social Activity (1961 – 1975).